I am by no means a DIY-er, and I’m not even really a fascinator or head gear person, either. But my family was going to the Thanksgiving Day horse race in New Orleans, which people really dress up for, and I had already worn my only other topper to a watch party for Meghan and Harry’s wedding. I wanted to rock something slightly more dramatic than my usual turkey day attire. I started looking online and found a slew of the usual suspects - you know, those tough little bra-insert looking disks with weird antennae and mesh netting that clip in, or bubble gum, saccharine church hats. 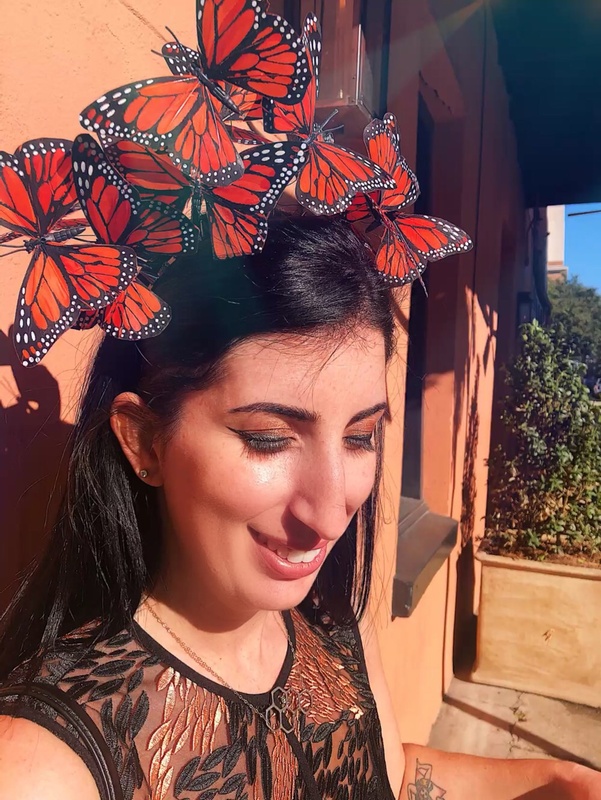 I was about to just order a cheapo little clip-on from Amazon when I stumbled across a beautiful, butterfly-covered headband - for $120. That’s not an exorbitant sum, but for something I’d wear once, maybe twice…I sent the link to a few pals, and one of them (Anna, what’s good?) suggested I try to make it myself. I was so wrong - this piece took me under an hour to make from start to finish, and cost, all said and done, around $10. If there were a Yelp for DIY projects, I’d give this an enthusiastic 5-stars. If you’re still in the research phase, allow me to share a couple words of advice - I came across so many videos and blog posts that made this sound way more complicated than it really is. Seriously. One woman was sewing crystals by hand onto each butterfly and cutting disks out of cardboard that she covered in fabric for some reason…Forget all that, the butterflies are already enough of a statement so just roll with a simple version of this, and save your precious hours for going out wearing your new fascinator. Hot glue gun - and glue. That goes without saying. Headband - you can buy one, or you can repurpose one you already have. I had a cool spiky one from BCBG that I don’t wear anymore, so I reused that. Make sure it’s relatively thin but very sturdy, nothing that feels like you could snap it with your fingers. 10 feather butterflies - I got a pack of 10 2.5” feather butterflies from Michaels for around $6 (with a coupon, which they always have - otherwise they’re $8.99 without the coupon). 26 Gauge Wire - This is just the right gauge - thick enough to be sturdy, thin enough that the butterflies still flap around ever so gently. The wire comes with a built in wire cutter, but I have my own, so I used that. Helpful but not mandatory - a jewelry/craft plier or a tweezer. It’ll work better and faster than using your fingers. Unpack your butterflies carefully. You’ll find that they each already come attached to a very thin silver wire. I started out using the silver wire, but when I tried it on during the project to check placement, I hated the way the silver caught the light and looked so obvious. Gently tug the wire with a tweezer to remove it - it comes out relatively easily. Fire up your glue gun. Cut 10 pieces of wire. You’ll want to make each butterfly “fly” at a different height so it a.) looks cooler and b.) so they’re not fighting for space. Cut pieces around 12-15” in length. Make a dot of glue on the back of each butterfly, and stick the end of your cut pieces of wire into the glue so it’s kind of sunken in and will stay put when dry. IMPORTANT: Make sure the tip of the wire ends up, when you’re done wrapping, on the top part of the headband, not on the underside of it, which will be against your scalp. This will just dig in and be really itchy and uncomfortable. If necessary, cut it shorter if you run out of wire before the final wrap, and tuck it into the rest of the wire wrap or smush it in. It’ll generally stay put. Repeat with all 10 butterflies, trying it on periodically to see where you want to place the next one and how it feels. That, my friends, is it. You’re donezo. You made an awesome fascinator. 10/10 would make again, and actually have plans to do so for my friends. You can adjust and readjust the butterflies when the headband is on. After you finish, you’ll probably want to shift some around, pull some forward, tilt some backwards. You can do this a bunch of times, even when you walk around wearing it, sort of like pushing back a tendril of hair. It’s normal for them to shift around a bit as you walk, and it’ll feel great to have them kind of dancing around right above your head. Be ready to have a safe place to store this. I kept mine in a shoe box. Make sure there’s room for them all to be spread out, but don’t get too obsessive about it. They will spring right back out when you take them out of the box, and you can rezhuzhe and reposition them when you take it out of the box before an event or party. Have you tried this? Please so let me know what you thought of the process and the results in the comments, dying to hear how it all goes for you guys!